We are excited to announce the launch of Peter Mars Authentic™ Licensing! In conjunction with licensing agency Lisa Marks & Associates, corporations, agencies, celebrities and others can now work directly with Peter Mars to create new and artistic interpretations of their brands. 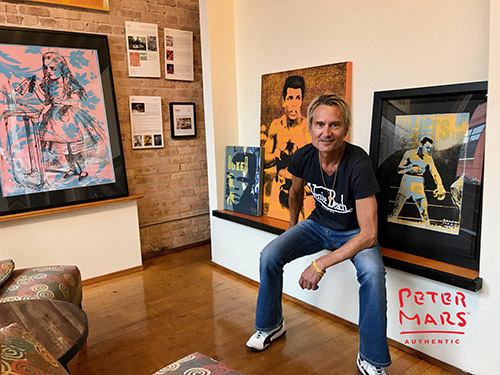 NORTH AMERICA–Lisa Marks Associates has partnered with the newly formed Peter Mars Authentic, pop artist Peter Mars’ official brand, to expand the artist’s presence across multiple categories. LMA WILL ROLL OUT A BROAD LICENSING PROGRAM FOR APPAREL, ACCESSORIES, HOME DÉCOR AND MORE. Mars is known for his portrayals of American pop culture, which LMA will aim to expand into categories spanning apparel and accessories, home décor, gifts and collectibles, food and beverages, brand collaborations and more. Commonly exhibited alongside artists like Andy Warhol and Jean-Michel Basquiat, Mars has successfully collaborated with Elvis Presley Enterprises, Muhammad Ali Enterprises, Carroll Shelby and Penguin Books on a range of products.